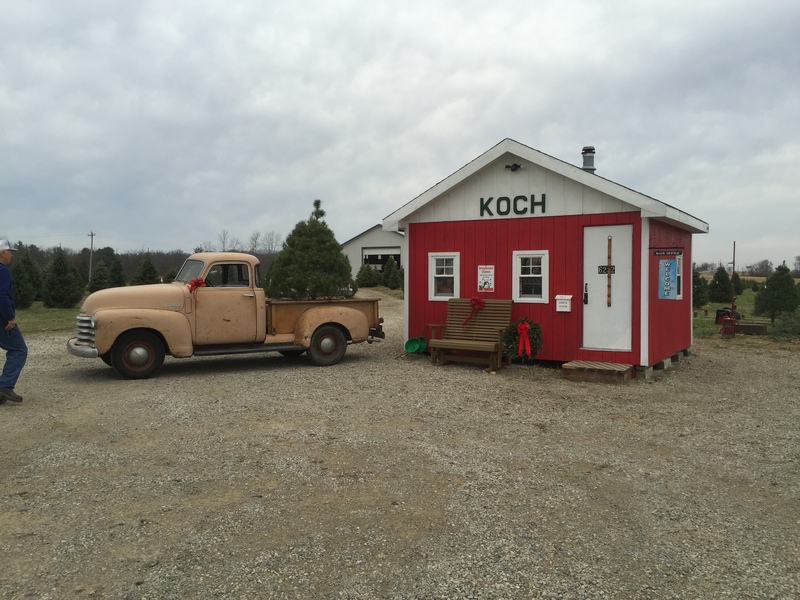 Welcome to Koch Christmas Trees! You are invited to visit our family owned tree farm located in picturesque Reily Township, in western Butler County, SW Ohio. We have been in business since 2001, selling quality cut-your-own Christmas trees to many satisfied customers. We are a small nursery and therefore are only open on weekends from 10 am to 5 pm. from the weekend after Thanksgiving until the weekend before Christmas. In addition, we are open the Friday after Thanksgiving. Due to a death in the family, we will be closed on Saturday December 22, 2108. We are currently out of Canann Fir and Frazier fir. We have a limited supply of Scotch Pine and White Pine. Our selection of trees includes Scotch pine, White pine and Blue spruce and Canaan fir. We also bring in prime pre-cut Fraser fir trees from Michigan which are hanging in our barn for easy viewing. We have a limited selection of Douglas and Concolor (White) Fir for sale this year. In addition, we have balled and burlap blue spruce, white fir and white spruce available. We also sell handmade fresh wreaths at our farm. These are available in various sizes ranging from 16 inch to 32 inches in diameter. Custom wreaths are made upon request. Table top trees and stands are also available. Our farm workers will assist you with cutting the tree you select; or we have hand saws available for your use. We would ask that you not bring your own chain saw to use. We will shake the tree you selected to remove the debris and properly fit, or drill, the cut end of the tree for a tree stand. We also have tree stands available for you to purchase or you can bring yours back from last year for the perfect fit. Tree wrapping is available free of charge. Dogs on leashes are welcome provided owners clean up after their pet(s). We accept cash, check, credit/debit cards, Apple pay. Treats and hot chocolate are free to all. We wish you a Merry Christmas and hope that you will enjoy your experience picking out a tree at Koch Christmas Trees!